The Lionhead rabbit is one of the newer breeds of rabbit and was recognised by the British Rabbit Council (BRC) in 2002, in all known colours and patterns. Imported into the US in the late 1990s, the Lionhead rabbit is currently undergoing the American Rabbit Breeders Association (ARBA) evaluation process, as a new breed of rabbit. Distinguishable features are the 'mane' of wool around their head which is similar to that of a male lion, hence the name. The slightly rounded and broad head is set close to the body with short thick upright ears, 2"-3" (5cm-7.5cm) in length, and a well developed muzzle. Average lifespan of the Lionhead rabbit is 7 to 9 years but the age of any rabbit is dependent on the care and, just as importantly, the diet. The mane of the Lionhead rabbit is of soft wool thick, with a crimping effect and at least 2"-3" (5cm-7.5cm) in length, forming a full circle around the head, standing up in a fringe around the head and extending to a 'bib' on the chest running into a "V" at the back of the neck. The rest of the body is of soft, medium length, normal fur. Some Lionheads have longer fur around the back legs and on the cheeks and chest. 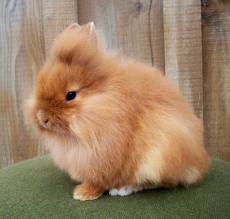 Lionheads have become very popular as show rabbits. They are a recent breed with development still in progress. Depending on the breeds used to produce each line, the temperament can differ, but generally Lionheads are easy to train and make excellent pets. 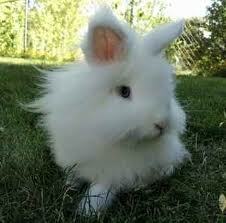 Lionheads have a playful nature, are very friendly, lively, sociable and good natured rabbits. They are timid in nature and as with rabbits in general, showing attention, along with gentleness and understanding will gain the rabbits trust. Although small, they are active and playful and need plenty of space. These rabbits need experienced handling since they can easily be frightened and because of this, may become aggressive. For these reasons they are not generally recommended with children. bi colours (white and one other colour), tri colours (white and 2 other colours) and various shadings apply to the above. Care requirements, especially with diet, are generally the same as with other breeds of rabbit, but Lionhead rabbits may be more prone to dental disease than other breeds and have more risk of developing hairballs, leading to digestive problems, both of which can be potentially fatal conditions. As, when buying any rabbit, buy from a reputable breeder or rescue centre and observe the rabbit's temperament. When buying a Lionhead, also inquire as to any hereditary dental concerns. The longer wool of the Lionhead's 'mane' needs to be combed once a week to prevent matting and daily grooming is necessary during moult. Once they reach adulthood they do not require extensive grooming in the way that other wool breeds do. The origins of the Lionhead rabbit are fairly vague with different accounts of how and where the lionhead mutation first occurred. One account is the Lionhead originated in Belgium by breeders trying to breed a long coated dwarf rabbit, with the Lionhead becoming more popular than the long coated dwarf. They certainly originated in Europe, with the Dwarf Angora playing an important part in the early development. The Lionhead rabbit was developed following genetic mutation that caused the growth of a longer 'mane' of hair around the head with the lionhead gene being the first major mutation in rabbits since 1932. Rabbits with the 'mane' gene were imported to Britain and bred with other small wool breeds and dwarf breeds to develop the Lionhead breed. Whichever account is considered, most agree that there is a dash of Angora or Swiss Fox in the breeding. The mutation is dominant in that, if a Lionhead is crossed with a normal rabbit, it will still pass on the 'mane' gene to some offspring, thereby producing more Lionheads. Double mane: A regular mane of wool all the way around the head and some have transitional wool around the hindquarters, tail and their hips that is sometimes referred to as a skirt. Single mane: mane that is around its head, ears, chin and sometimes chest. The mane wool diminishes as they get older. No mane types: no mane looks like an ordinary rabbit similar to a larger Netherland Dwarf. Crossing two single 'mane' rabbits result in some double 'mane' (MM), some single 'mane' (Mm) and some rabbits inheriting two recessive genes will have normal fur (mm). Double 'mane' can often develop too much fur and single 'mane' usually loses some of their 'mane' in adulthood. For this reason, breeding the ideal lionhead is rather complex.